"Easy!!!! Can't wait to get jumping!" We LOVE our Springfree Trampoline! We've had it for 3 years now and we couldn't be happier with it! Our four kids can't get enough! "Our girls LOVE their trampoline. As a competitive dancer and competitive gymnast, they love it!! I love the strong net!!!" "I was very impressed with the professionalism displayed by Springfree. My daughter has been asking for a trampoline for a while. My wife and I explored our options before deciding to go with Springfree. I called Aimee Glennie on a Wednesday afternoon to place our order. She suggested that Springfree could deliver and install by the next day. By the time I got home on Thursday evening, I found the trampoline installed and my daughter happily jumping up and down! It was a pleasure doing business with Springfree and I am happy to recommend them to others who are looking for a trampoline. " Thank you for the kind review Ananish! Happy jumping to you and your family! "I love this company, it is the third one I've ordered in last 3 months. Also the men that came last week to my daughter from Charlotte were great and professional. I've told everyone about product and company." Thank you for the kind review! And happy jumping to you and your family! "We purchased the S113 Springfree Trampoline this summer and it is one of the best purchases we have made for our family. Our two energetic boys (2 & 4) absolutely love using it and so do my husband and I! As a parent, I feel comfortable with my little ones jumping and knowing they won't fall off or hurt themselves on springs. Plus, our neighbors appreciate how quiet it is. " Thanks for the kind review! Happy jumping to you and your family ???? "Love all the videos. I was worried that the bounciness would be less than regular trampolines but that is not the case. My kids have been on our springfree trampoline nonstop. My 17 year old said, 'They have thought of everything,' referring to Springfree. Everything is made with quality and safety in mind. Well worth the extra money! The money you save on ER visits for a leg caught in springs or someone flying through the net and breaking a bone, more than makes up for the price difference of this safe trampoline. " Thanks for the kind review. Happy jumping to you and your family! "I was skeptical about paying the premium price for the large square trampoline but as noted by other reviewers............you get what you pay for. I am very particular about what I spend my money on and this trampoline has definitely exceeded my expectations! It is built very well and is by far the favorite trampoline in the neighborhood. If you are looking for the best trampoline on the market today the Springfree line is hands down the winner in that category. I suggest going with the largest trampoline you can afford and have space for. The sizes may appear to be smaller than other trampoline brands, but when you factor in the area used by springs on other brands, the size discrepancy all but disappears. I did have one small quality related issue when the trampoline was delivered, but the Customer Service department promptly and thoroughly addressed my needs. Assembly can be a little tricky, but as others have noted, follow the instructions and watch the video tutorials and it goes together quite nicely with 2 people. I don't think there has been a single day in the past 3 months when the trampoline was not being used. Thanks Springfree for a great product that my entire family loves!" "For those of us that own a Springfree, we know how good they are...awesome. What I was most impressed about was the installation service available. Not having the time or patience to piece together, we have used this service twice now (having just moved interstate). A pleasant experience from start to finish. Clear communication about dates and time was brilliant, but we were lucky enough to have Jarryd install ours recently on the Gold Coast and he truly was an asset for your business. Nothing too much trouble and respectful to the delicate surroundings (garden etc) Well done Springfree, and congratulations Jarryd." "We have had the best customer service ever with a warranty replacement for our old trampoline that had rusted out over a few years. A very honest company who value their customers. I am so impressed. They still honoured the warranty despite us living in near the sea and in a salty environment. " "Easy to use, great video`s showcassing the products! I wanted to give 5 Stars on everyrhing, but somehow it will not let me! Product arrived much ealier than stated and was perfect. We have sll been outside using it. My youngest has a lot of extra enegry ( He is 10yrs) and he can't get enough of it. Love it!!" "Best and safest trampoline ever! This is my second purchase of the same one for a new home. Easy wedsite to navigate. Thank you!" "Money well spent! Love our new trampoline!" "I saw 4 different springfree in homes in my new subdivision and had to have one!" "Incredible products! My kids love it! The best trampoline available. Period!" "Best trampoline on the market, not even close....best bounce, construction, safety"
"Springfree is the best and safest trampoline on the market - DO NOT SKIMP for SAFETY PURPOSES! You will not regret one penny spent on this amazing and safe trampoline. Priceless and safe joy for your kids! DO NOT HESITATE - quality ... quality... quality ...safety!" "We have had the trampoline for a month now. Fun for the entire family, as well as neighbors, and relatives!" "Feel very confident that I've purchased the safest trampoline for my children." "We like the design and attention to safety. 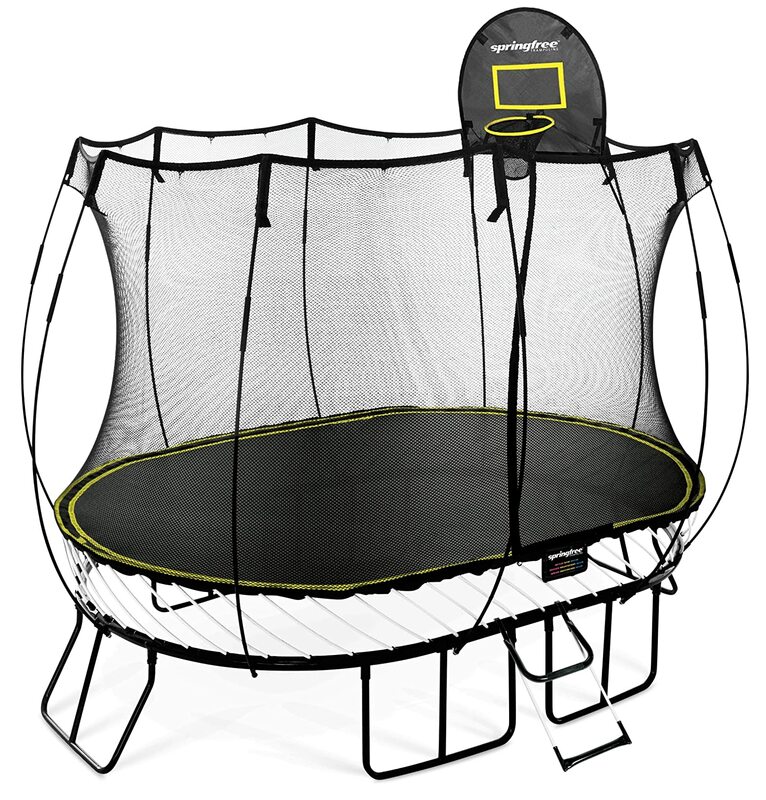 We saw a mass market trampoline today at Walmart and my daughter said, "No way, Dad. I would die on that one.""